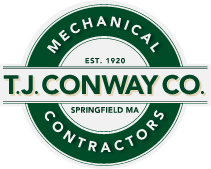 T. J. Conway Company is an established mechanical contractor that brings state-of-the-art innovation and in-depth technological knowledge to each project. Started in 1920 by Irish immigrant Thomas Conway, T. J. Conway became a strong business from a foundation of experience and an impeccable work ethic, securing more than just a job well done—a job of excellence. A reputation for quality workmanship-from the building of the Hotel Charles in 1929 to building Mercy Hospital in the 70s and the recent completion of the Boyden Library at Deerfield Academy -is a well- deserved accolade for this team of 60 plus employees. Thomas Conway, president and CEO, leads the third generation of the company into the ever-changing 21st century, navigating complex regulations and mechanical advancements with know-how and enthusiasm. The breadth of services-plumbing, heating, air conditioning, process piping, and mechanical services-is only part of the story. The rest is comprised of working side by side with clients to compose a comprehensive plan of action that results in a quality response, every time. T. J. Conway has an impressive list of projects and partnerships throughout the region. New and old clients alike, from Elms College to the 60-year history with the Diocese of Springfield, trust their buildings to T. J. Conway. Attention to detail throughout each phase of a project, and follow-through that doesn't end when the switch is thrown, tells each customer they are collaborating with quality professionals who care.